This position paper alerts architects to the significance of the use of the word “shelter” as an international cornerstone in our perception of architecture. A critical first move in implementing the NZIA Environmental Policy is to see the built environment not as “sheltering” us from a hostile and unfriendly natural world, but rather as enabling us to relate more closely to a natural environment which wants to give us life. Language can be very important. The words we use reinforce hidden agendas, and reconfirm myths. Words are symbols which convey much more than dictionary definitions. “Income support” is not the same as “social welfare”. The shift in language represents a shift in attitude. 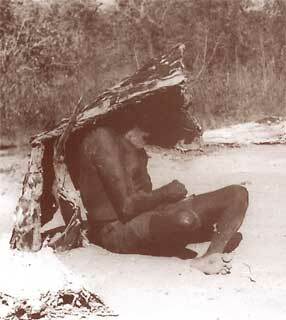 In the conventional wisdom architecture is seen as being first and foremost about shelter. For the lay person food and shelter are seen as basic needs. The term shelter has served us well. The global environmental crisis has however caused us to look again at many aspects of the conventional wisdom. Food is good, but too much food is bad. An appropriate amount of food is exactly right, and a wise person does not go on eating more and more food, but rather increases the quality of food they eat. This is the principle of counter-productivity, and the art of being alive is the art of living at the peak of the curve of counterproductivity. Shelter is good, but too much shelter is bad. An appropriate amount of shelter is exactly right. A wise person does not go on providing more and more shelter, but seeks rather to increase the quality of their shelter. 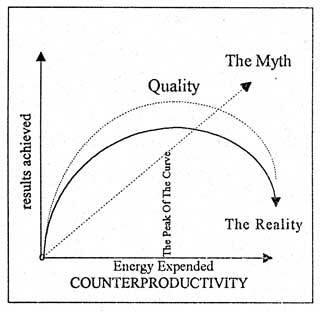 The focus on quality which is implied by living at the peak of the curve of counterproductivity is in fact a focus on architecture. The assumption that you can never have too much shelter not only absorbs resources but also moves buildings increasingly towards mediocrity. The same could be said of “security” for example. When a building becomes a prison re-evaluation is needed. 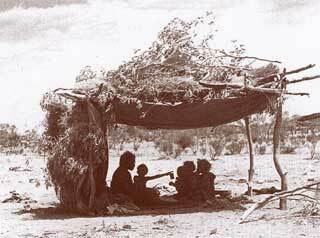 The term shelter implies a negative and defensive attitude to the natural environment. The primary purpose of the built environment is not to “shelter” us from a hostile and unfriendly natural world, but rather to enable us to relate more closely to a natural environment which wants to give us life. The Earth Summit in Rio de Janeiro in June 1992 did not resolve many issues in the “sustainability” debate, but it did bring some conflicts into clearer focus. One of these was the way in which the international focus on providing “shelter” has worked against environmental quality and generated enormous and avoidable environmental cost. The person who has no shelter certainly needs shelter, but even here architectural solutions which are founded on a negative and defensive attitude to the natural environment will be fundamentally flawed. Making a move from seeing architecture as “shelter” to seeing design as a process which enhances the relationship between people and place does not need to involve any cost, but it does demand a radical shift in the conventional wisdom. It is this kind of radical shift which Teddy Goldsmith contends is essential if we are to deal with the global environmental crisis. When building is seen first and foremost as providing “shelter”, architecture is seen as providing something more than, or beyond, shelter. Architects are seen as providing an extra aesthetic dimension after the technical problems of protection have been solved. Architectural employment is the inevitable result. When building is seen first and foremost as bringing people into harmony with the natural environment the architect is seen as an expert with the design skills necessary to achieve this in the fullest possible way. Design is this integrative process of bringing a complex network of relationships into harmony. Shelter implies bi-polar thinking. Creating a duality between the built environment and the natural environment sets up conflicts which can only result in destructiveness, alienation, stress and violence. Integrative design implies multi-polar thinking. The need to experience a storm is brought into harmony with the need for a measure of protection from the storm. The storm is not taken away. It is integrated into. “Shelter” implies problem solving, but the environment is no longer able to sustain solutions to short-term problems which generate long-term environmental consequences. 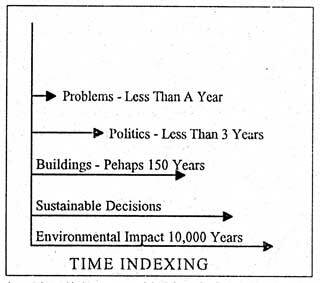 Time indexing architectural design leads to the inevitable conclusion that problem-generated design will always be unsustainable. Environmental design reduces environmental stress and takes into account the entire life cycle of design decisions. Architecture which only solves problems of shelter will never rise above its own negative energy. Dealing with problems is energy intensive. Avoiding problems is energy efficient. Architects who take a pro-active approach to design deal in positive energy, and recognise that leading a healthy life means more than avoiding being sick. “Shelter” implies a loss of diversity. Intellectual decisions isolated from place tend towards uniformity. Environmental design implies an increasing richness of diversity in response to the rich diversity of the natural environment. The greater the division between the built environment and nature the greater the architectural stress. Artificial lighting, for example, lacks the transitional phase which is found in nature. Our sensibilities are simply jarred into a new situation with the flick of a switch. When night becomes day without the wonder and magic of the sunrise, it is impossible to understand either the night or the day. People who only measure lumens forget to measure the tension of living in a brittle world where people and technologies snap without warning. Design which integrates the natural environment and the built environment celebrates transitions and seeks to emulate the threshold of the sunrise and the sunset. Changing a word can change our way of thinking. Changing our way of thinking can change our way of acting. Changing our way of acting can open up a new dimension in our way of living and practising architecture. It need cost us nothing more than a little thought. The time has come to say farewell to shelter. This Position Paper was published by the New Zealand Institute of Architects and issued to all architects to support the NZIA Environmental Poicy.